Letting our children to learn a new musical instrument is good to help them develop their body and promoting a better learning skill later. Among those many instruments out there, piano seem to be still one of the popular option for parents. 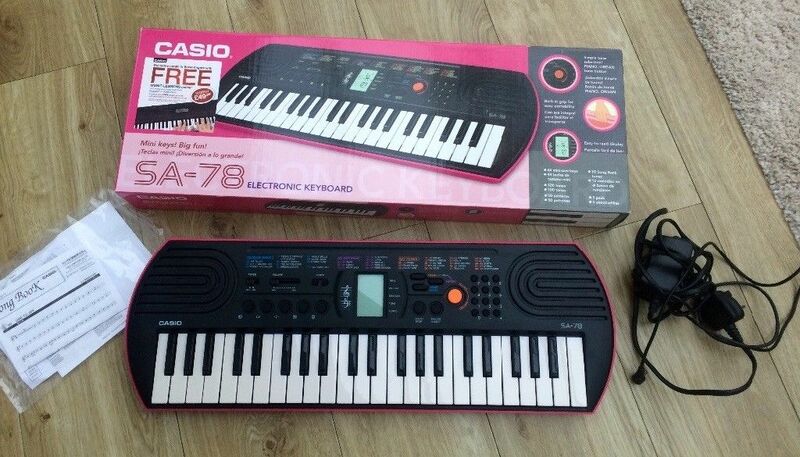 For children or young beginners, Casio SA 76 vs 78 can be a good option to go because they are built for the specific market. If you are also considering these models, go check what they can offer to you and how they differ below. Just like with everything else, we need a proper tool or equipment when starting to learn something and the most suitable or best equipment is those that can let us the user learn faster by promoting a better understanding and material to learn as well as easier to understand. This is of course not the work of any tool and with the lack of experience of knowledge we have, choosing one of them can be a daunting task to do. This is also happening when you want to purchase a first piano for your children, moreover, if you are not a musician or have an experience on how to play or understand the instrument since let’s face it, not all of us have the luxury to learn them when we are still young. Now when we are older and have children, we want them to learn and play as much as they can. One of our method is supporting them to learn a new instrument. The most often advice when purchasing a new piano for children is to look for the one with full key or 88 keys keyboard or acoustic piano, this size can be too big for young players and of course very expensive if you are not sure yet whether your children will stay using them or losing an interest after 3 months. If your children is still very young, you may want to pick a smaller piano or keyboard with lesser keys like 44 keyboard. This size is suitable for any young children since they have lesser keys for their smaller hand and chances are they are not going to play any complex song here either. Another thing you may want to consider is the collection inside or the sound since as a beginner piano, we are trying to keep children entertain and this can be helpful to make sure they can always discover new sound and prevent the boredom especially if they are still very young. If you are already have an image on what kind of piano you want to purchase, now is the time to hunt for the unit. However, with the huge option, most of the time we can get lost in the middle of searching. If you don’t want to spend so much time or going back and forth from different brands and models available out there, in our opinion it is better to stay with one brand and consider the option from their collection. Choosing a well-known or popular brand is also beneficial since they are the most likely to also offer good quality product. 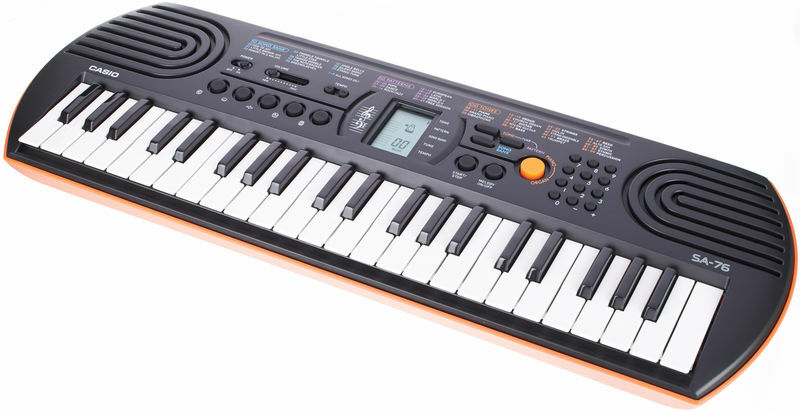 Among those many names, we are sure most people are already familiar with Casio because they are many people’s favorite when it comes to musical instrument especially their piano that not only available in such an affordable price but also made with good quality and dependable sound with various level of skills to suit any players looking for the right keyboard for their journey. The first thing we love from Casio is they seem to always have the choice for your budget so looking for the most suitable piano can be easier and as for the beginner pianos mainly marketed for young players or children, Casio SA 76 and SA 78 are the perfect unit to choose. Both of them are piano mainly marketed for younger children due to how they put the limited capabilities and much sound collections supported by the child-like theme. As you can see from the sample picture above, both of Casio SA 76 and SA 78 are very similar to each other if not identical with the same design or shape as well as control layout. What differs them from the outside is their color option and model name printed on the face; the SA 76 is combining black with orange while the other is combining black with purple but in general they are the same. It has a curved side and points so make sure to put them on a table to prevent your children bumping into the unit when playing around. They are also featured with two speakers placed in each of their top cover. As for the control layouts, they may look complicated at first but each one of those buttons are marked to specify what they are used for while the middle is featured with a small screen to make the operation become more convenient. 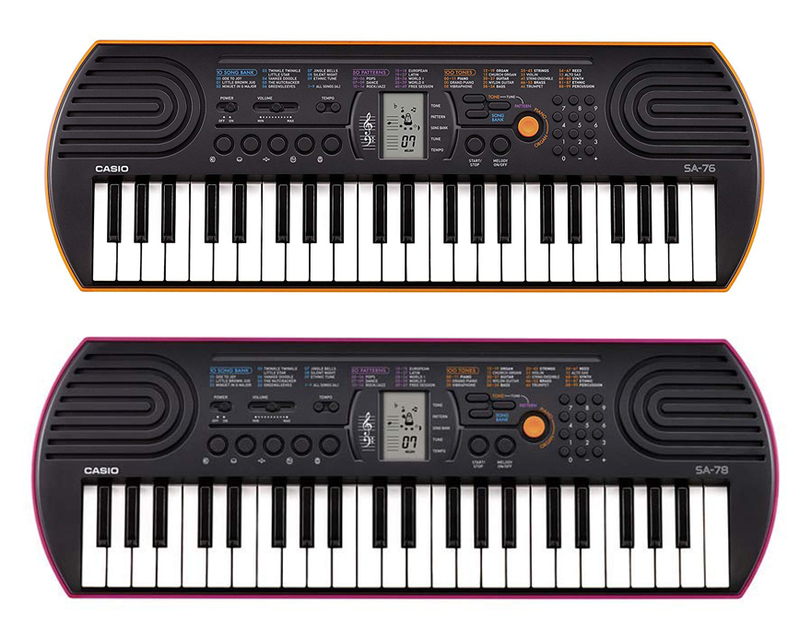 As it has been mentioned above, what we consider when looking for a piano for a children in younger age is the size and both of Casio SA 76 and SA 78 are extremely small which will suit smaller players with their smaller finger and short arm, so they won’t have to reach keys that located far apart from where they are currently playing. While 44 keys is indeed shorter than many other beginner pianos out there, this size should work just as good. Moreover, if this is their first time learning how to play the instrument or never had an experience on playing a larger item before. This small set of keys are helpful to allow children get used to the unit and focus them better on where they need to place the hand rather than forcing them to stretch it. The small size is also great when they need to transfer the unit from places to places or to keep them in a desk drawer. Read also: Casio SA 76 vs 77 here. The next thing that exactly the same in both pianos is their sound collection and if you are concern on how many Casio did include in these pianos since the size is quite petite, you don’t have to worry since they manage to put 100 tones, 50 rhythms and 10 built in songs that are necessary. These collections is useful to let children learn how to play the instrument and entertain them at the same time so they can get more curious and learn more. We can access those sounds and songs from the control panel at the top and thanks to their small LCD display, navigating through those many options is a breeze while we have to admit that the screen they used here is definitely not the best. In our opinion, the best sound in Casio SA 76 and SA 78 is their grand piano because they are backed by the company’s reputation of building musical machines but as a beginner item they are still not amazingly good. As for the polyphony count, both of these models are still using 8 polyphony which is surprising and not at the same time. They are not surprising since both models are created for younger player learning and walking their first step into the musical journey but is amazing as well since it is very rare to see even for smaller pianos to have this less notes because most of them are featured with at least 32 notes. This lack of polyphony notes can be quite a concern for some parents because it means we can’t play a little bit more complex song yet considering that they are only equipped with 44 keys may put an ease to your concern. On the learning side, those 50 rhythm collections are wonderful to provide a viable options for young players a sense of rhythm and composition when playing their song. In addition to these rhythms, we can have 10 practice tunes that any beginner can use to hear how the piano is supposed to be played as well as to accompany them when playing. Another learning feature that we love is the Melody Cut Rehearsal system that is built in both Casio SA 76 and SA 78 to assist players on learning with the right hand. Most players are learning with their right hand first then continue with the left hand; this feature will give a headstart on the right part first. Now, let’s compare Casio SA 76 with SA 78. As you may already know, both of them are very similar to each other if not the same since all of their specification are the same. What separate them from each other is only the color option used to add a more interesting look to the pianos and we don’t think it will affect the performance. All in all, both of them are a good option for any young learners who want to have a dedicated item to start their journey. Depend on the seller, both of them are also mainly sold at a similar price so choosing which the better option should depend on which color your children loves better.